by Benay | Nov 9, 2015 | Inspire Me! For those of you who like to know more about the people you work with, here is my backstory: how I got into coaching, found my niche and the breakthroughs that made my coaching business a success. Today all of my biggest dreams are coming true. So much so that this year I’ve set new and bigger goals. I am an essential part of my loving, nurturing and fun little family. I have close, inspiring friends all over the world. I run an online business that helps coaches, makes the world a better place, and makes money. I didn’t have to win the lottery or sacrifice parts of my life to make any of this happen. In fact, I lead a more balanced life than I ever have. I spend less time working, spend less money and somehow have more of what I truly want all around me. On top of that, I feel totally amazing: peaceful, congruent, focused, driven and full of energy. I know in my heart of hearts that I’m on the right path. I love what I do and wake up in the morning inspired and motivated about what the day holds (at least most days!). Life is good and I’ve taken (and still take) an active part it making it that way. Let me take you back to the Summer of 2006 (which was actually winter because I lived in Australia then). I knew something needed to change but didn’t know where to start. Yet, despite the many non-resourceful qualities I had in the past, I was (and still am) a loving, honest person. Back then, I was simply doing the best I could with the resources available to me at the time. Back then, I had all of the outward signs of success (nice car, house with a pool, great job, loving husband) but deep down I knew that I was not living my fullest potential. I wanted more. It was like having an itch I couldn’t quite scratch. I knew I wanted to be my own boss, to own my own time, to create assets that would work for me – giving me a passive income. I wanted to believe in my work because I’m the type of person who gives everything to what I do. I wanted to feel complete – like if I kicked the bucket tomorrow, I could honestly say that I was doing my absolute best every day – no regrets. So, like you, I decided to start a coaching business. On 11 October, 2006, on what now seems like a whim, I signed up for a life coach training program, with The Coaching Institute, Melbourne, Australia. The next month, I attended my first life coach training as a student. During that weekend, I realized that I did have a whole lot of power, I just hadn’t known how to tap into it before. From then on I decided to take personal responsibility for ALL of my results (even if they seemed out of my control) AND to routinely take action toward creating my ideal life. I also knew that running a coaching business was what I was meant to do. The week I got back from my training, I indeed started my first coaching business and even started working with my first paying coaching client. She was a colleague of mine from my day job so, our meetings were over lunch, or just after work. We sat on a private bench within the office complex. I felt invincible! Here I was walking the talk and teaching others life skills that mattered and that made a lasting difference. I felt so good about my work. Believing that you can define your own reality and make it happen. Spending less time on things that don’t move you towards your dream life and more time on activities that do move you toward your dream life. How moving forward toward your vision each week expands your comfort zones and opens up new possibilities you don’t even know exist yet. How to discover what really matters for you to be happy through good personal development planning. Simple tools for empowering yourself from within including; the 4-levels of being, mastering your negative self-talk, and the cause or effect principle. How changing your language – the way you use words and construct sentences – impacts your future. That there is no failure only feedback. I documented these ideas in my very first ebook (which turned into more than one). If you want to learn the core life skills I use in my own life and also teach, feel free to check out, ‘The Define Your Own Reality ebook Set’. I was personally growing and changing at an amazing rate. Baggage that I had been unknowingly carrying around my whole life was being completely cleared away. My marriage became even better (I write about why here) and my confidence at work was through the roof. My personal life was shifting in ways I had never imagined. So many new possibilities were opening up and I could see that they were within my grasp. It was an exciting time. As I got to know myself even more I started to realise that being good at personal development does not automatically make you good at business. Busier than ever. Working a part-time job and a part-time coaching business. Wearing more hats than I could handle and feeling like I was living 2 different lives. No consistency to my coaching income and no passive income. Damn it. I wanted to do more than ‘get by’. I wanted to quit my job, focus on my coaching business and live an awesome life on my terms. Now (thank you very much)! Even though I had some success and was awarded some great coaching contracts, I wasn’t that much happier than I was before. Running my coaching business felt hard and was not particularly fun. Things just weren’t flowing. Looking back, it’s easy for me to see where I went wrong. I put my business first and my lifestyle second. I choose some ill-suited coaching niches when I started out. I was an average coach on lots of topics for lots of different types of people (e.g. career coaching for corporate and government middle management, communication skills for consultants, relationship coaching, vision and goal setting coaching, teens coaching). I was trading time for money in a local market place. I spent way too much time comparing myself to others (anyone else ever suffer from the ‘not-good-enough’ syndrome? Isn’t it great – LOL!). Once I sorted out those issues my breakthrough finally came and I found my calling as a coach. 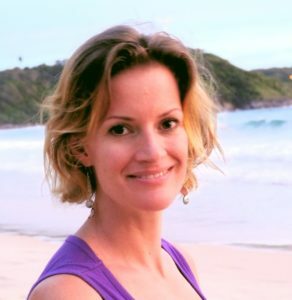 Through my coaching journey I finally discovered that I was meant to leverage my; acute auditory digital (AD) modality / extensive IT and business systems background / passion for life-coaching / personal interest in manifesting an international life-style / and experience running different types of coaching businesses, to assist coaches who want help creating tools, products and services for their clients. So simple and perfectly suited to me. Ready-made templates and coaching programs that other coaches can re-brand and use in their own coaching business. Ebooks, programs, and one-on-one coaching for coaching business owners who want help creating their own online coaching products and selling them online. Life Coach Office to help coaches securely manage their coaching clients from anywhere in the world. And this is just the beginning. I have more ideas now than I can keep up with and it feels great. It took me years to figure this out but it’s my hope that you can stand on my shoulders and have success in your coaching business a whole lot faster. Here is my tried and tested recipe for being happy AND wealthy from your coaching. Design your ideal business lifestyle. Don’t design your life around your business, design a business that gives you the life you dream about having. That vision then becomes the overarching goal of your whole business. Because of the prize waiting for you at the end, you will always be motivated to see it through. If you derail, your vision will help you decide what to do to get back on track. Choose a niche that’s perfect for YOU. That means it’s well suited to your true skills, expertise and passions. If you have them, make sure it leverages your years of professional experience. No matter how much you think you need to get away from it, this is one of your top assets. I see this love/hate relationship in my clients all the time. Find peace with your expertise. Find a clever way to incorporate coaching into it. If you have a clear niche and focus for your coaching, wonderful – you are one of the few coaches out there who do (if this is you and you are still not online and want help, I want to work with you). If you don’t already have a coaching niche that you are perfectly suited for and love, don’t worry, you’re not alone – LOL! And I have good news. 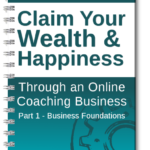 We have just finished putting together the ‘Claim Your Wealth and Happiness‘ workbook: 165 pages of inspiration, information and exercises – as used in the Foundations segment of our $2,000 top-of-the-line program: Coach Changemakers Academy. If you diligently apply yourself to this new workbook, I am confident you will indeed discover a coaching niche perfectly suited to you plus the essential foundations you must have in place to build a coaching business that is both fulfilling AND financially rewarding. Get your copy here. Become the go-to expert on a specific topic for your ideal client. Coaching anyone who’s ready for change is just not good enough these days. Choose a specific problem and help your ideal client solve it efficiently and effectively. Only work with clients that you fully understand and love working with. Get online and create passive income streams ASAP! Stop focusing locally and get online. Reach your ideal clients who are in fact all over the world. Then diversify your coaching income streams by branching into online information products that you can sell from your website and generate a passive income from. You are good enough right now. Trust yourself even more and make your own decisions. Find YOUR coaching approaches and messages. There is no right way to do YOUR coaching business. YOU are the person best suited to make your business a success. If you are not taking responsibly for any part of your business, you need to start now. What new skills do you need? You don’t need to do all of the work, but you need to set the direction and make the big decisions about your niche, clients, products, and marketing. NO one can or should do this for you. I hope that by sharing my story with you, you might be inspired to play around with the lessons I’ve learned on my coaching journey and see if you too can discover the difference that will make the difference for you and your coaching business! Hi Benay! Your experiences of your life are soooo similar to mine. I am ready to start earning passive income but just needs some guidance on how to create my website. You have truly inspired me! Hi Benay. I love your story! Some people are meant to be frontliners, and some are great for providing support behind the scenes, like you! Your story is so inspirational and there’s really a niche for everyone! Thank you for sharing your story, I thought I would stop after a few sentences but I couldn’t stop reading. I enjoyed how honest and transparent you are. I knew I wanted to be a Life Coach after watching a show late at night featuring a career in Life Coaching, and I said thats it! The only thing holding me back for some reason was a Client tracking system. I realize it was nervousness after reading the program that it would be to complicated and I would be spending more time keeping up it. I felt at ease reading what LCO had to offer. Hopefully we can speak soon. Thank you for your help in bringing down a wall. Thank you for taking the time to write. I’m always happy to know when something I’ve written makes a difference! LCO has been a God-send for my coaching business. I love using it – but I am biased ;-). Would be happy to discuss it with you. I’m currently offering complimentary Coach Fast-Track Calls – they give me the opportunity to keep my finger on the pulse of where coaches are getting stuck and where they are thriving and they give the coach the opportunity to share their coaching journey and get personalized recommendations from someone who’s been in this game since 2009 – that’s me.